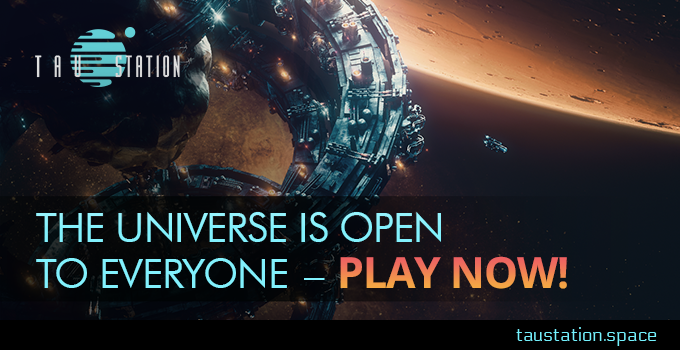 The Universe is Open to Everyone now! Join us – Sign-up here and start playing. Invitations are no longer needed! Progress – You will keep your progress; there will be no resets. Devices – Access your account via browser from PC, tablet, or smartphone. Accessibility – We follow WCAG 2.0 AA standards. PEGI – The game is rated PEGI-3. Here is a summary of useful on-boarding tips for everyone joining. Tutorial Mission – Play the starting mission and grab your reward at the end: a 3-day VIP pack! Area Tutorials – Read these to understand where you are and what you can do there. Chat – Talk to experienced community members and our team. Forums – Post questions, share your feedback and suggestions, or join discussions. Character Blog – Become part of the universe by writing your citizen blog. Tau Station is more than a game. Tau Station is a universe in perpetual evolution. Every week and every month, you will see new stories and new gameplay come to life, and you can be part of it. As a player, and as a character, never hesitate to talk to us or to share with us via the forum and the chat. …and here is a glimpse on upcoming features! Please keep in mind that like any games in development, Tau Station is still evolving, and will go through changes based on your feedback and our development of the game. Full release is scheduled for never, as we wish for Tau Station to keep growing beyond the hundreds of stars currently inhabited by humanity. Stay connected – Follow us on Facebook and Twitter, and stay up to date. Joins us and become part of Tau Station today! Fan sites – If you want to create a fan site, please read this announcement about our simple guidelines of using game assets on your site.